The recently released American Values Survey found that consistent libertarians make up seven percent of the American public, while an additional 15 percent have libertarian leanings. The Graphic of the Week explores the unique profile of this increasingly important political constituency. 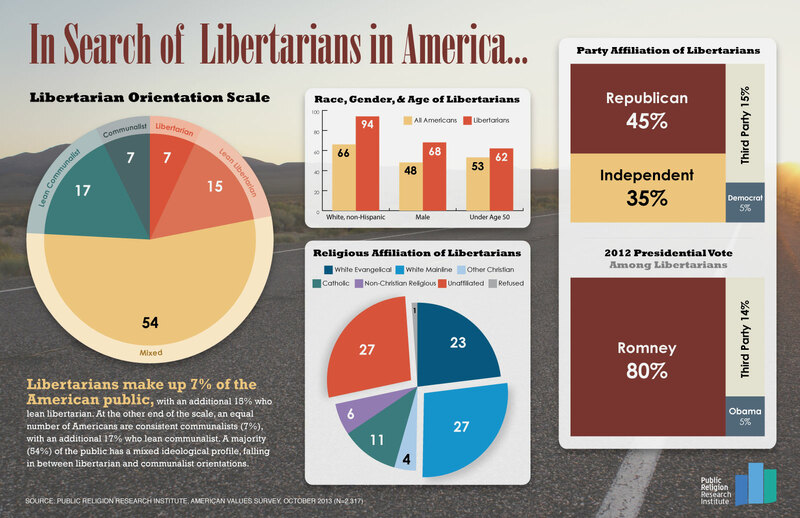 Compared to Americans overall, libertarians are composed of a much larger portion of men than women. More than two-thirds (68 percent) of libertarians are men, while 32 percent are women. They are also racially homogeneous, with nearly all (94 percent) libertarians identifying as non-Hispanic whites. They also skew significantly younger. More than 6-in-10 (62 percent) libertarians are under the age of 50, including one-quarter (25 percent) who are under the age of 30. Libertarians have a distinct religious profile as well. A majority of libertarians identify as white mainline Protestants (27 percent) or religiously unaffiliated (27 percent). Roughly one-quarter (23 percent) of libertarians identify as white evangelical Protestant, while only about 1-in-10 (11 percent) identify as Catholic. Although libertarian political beliefs—supportive of marijuana legalization while opposed to minimum wage hikes—make them somewhat unique, their political behavior closely resembles that of other conservative constituencies. In the 2012 presidential election, fully 8-in-10 (80 percent) libertarian voters say they supported Mitt Romney, while only 5 percent say they supported Barack Obama. Notably, however, 14 percent of libertarian voters report that they supported a third-party candidate. Close to half (45 percent) of libertarians identify as Republican, compared to only five percent who identify as Democrat. 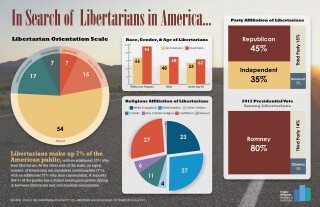 Taken together, the demographic, religious and political characteristics make libertarians unique in American politics today. To learn more about this constituency and for other findings from the 2013 American Values Survey: In Search of Libertarians in America, please check out the full report.